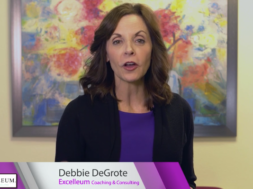 Hi it’s Debbie DeGrote again and have another Debbie Tip for you. So today we’re going to talk about the power of concentration. Someone asked me the other day where we was anybody born disciplined? You know maybe but I don’t really think so I think it’s really a habit or a pattern that we develop you know just like working out at the gym if you systematically strength train you will develop over time stronger muscles often agents select the real estate profession because they’re looking to be free to happen to be their own boss and to spontaneously flow through the day usually though very soon into their career they discover that this isn’t serving them so well they may feel lost they may feel stressed and they may find that the business is not delivering the predictable results that they desire so in other words they’re not a great boss ok so let’s really work on developing the muscle of discipline of focus and concentration and here’s the great news your brain love patterns it will adapt to any pattern that you teach it to adapt to you know I’m not telling you to do the crazy thing I do which is get up every day at 415-430 in the morning I’ve just developed that pattern because for the last 20 years I’ve had the opportunity to work with clients on the East Coast and you know I don’t even give it a thought because my brain has accepted it as a pattern all right so let’s put those good patterns in your life so that you can have the success you deserve and get rid of some of that stress of always feeling like you’re not in control of your day. All right, I’ll talk to you soon on the next Debbie’s Tips.